Explore the vast floodplain and beautiful rivers of outback NSW near Bourke on a car tour of Toorale National Park and State Conservation Area. You’ll enjoy great fishing and birdwatching. Experience an outback adventure at Toorale National Park and State Conservation Area (SCA). Awe-inspiring skies, dramatic sunsets and starry nights under Australian floodplain landscapes are just a few things you can enjoy while riverside camping at Darling River camp (Yapara Paaka Thuru). Picnic by the river bank to the sight and sound of birds at Many Big Rocks picnic area (Karnu Yalpa). Best visited between April and November, few places offer the rare opportunity to see the floodplain landscape come to life after rain like Toorale National Park and SCA. Located at the junction of Warrego and Darling rivers, the seasonal wetlands offer an abundance of birdlife, with ibis, pelicans, as well as iconic brolgas. This park lies within the traditional lands of Kurnu-Baakandji People. You can learn about their culture as well as the historic significance of this region on a Discovery tour. It’s the perfect addition to an outback tour, taking in neighbouring parks such as Gundabooka National Park. 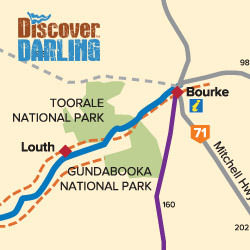 Continue for 21.5km and turn left at the sign to Louth, onto the unsealed Toorale Road (Rural Local Road 10). Drive for 38km and, after crossing a stock grid, you’ll see a Toorale entrance sign. Cross the bridge over the Darling River and travel 30km on the unsealed Toorale Road (Rural Local Road 10) towards Bourke. For more information visit Toorale National Park.